If you have ever spent hours and hours creating a family tree on a search site only to have people steal your research and use it incorrectly, you know how frustrating that can be. 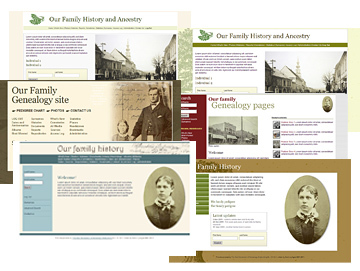 By having a site with WorldAncestors, you are in control of who gets permission to view it and what they can see. You can also change the way it looks too with our exclusive design templates. After all it's your site and your research, so you want it to look the best it can, without compromising on features. GEDCOM Import/Export: No need to input everything again. Dynamic Charts: Pedigree, descendants, timeline, family group sheets, etc. with print option and PDF creation. Dynamic language switching: have your site in multiple languages and switch between them. Customizeable: Choose from 6 pre-built exclusive templates. Security: Create users with various rights, protect living people and private data. Media: Upload and link photos, douments, videos and more. Multiple Trees: Host more than one family tree at a time. Import a GEDCOM file for each or add manually. Advanced pedigree charts: Display an indefinite number of generations with images and details. Descendancy chart: See an indefinite number of descendant generations for every person in your file with links to each person's individual page. Register chart: The Standard descendancy chart can instantly be toggled to display in text-only or Register format. Living persons data protected: Visitors to your site will be unable to see data for living individuals unless they log in with the appropriate access. Printer-friendly pages: A link on each page now shows you the same page in a new window, without any headers, sidebars or page backgrounds. Google Maps: Add multiple locations to a map with direct links to Google Earth. Visible to search engines: But only if you want it. Much more: Cemeteries, Dates & Anniversaries, "What's New", etc. We have developed 6 new design templates for TNG that are not available anywhere else! These are modern web designs that will make your information look clean and fresh. You can change the way it looks at any time in the Administration section, just by choosing a new template from the list. Remember - these templates are not available anywhere else! There is no uploading of code files and worrying about complicated terminology. We set it all up for you with your own domain name, so that you can concentrate on building your family tree. We realise that no matter how good the program is, you're going to have questions. Whatever your concern, please feel free to contact us. We will always reply as soon as possible. As you can see from the table below, there is a setup fee (free during the promotional period) that includes the licence for TNG, and a yearly hosting fee. That's all. There are no extra costs for web space or for technical support, so you can upload as many images and files as you like. You may, of course, request something special, which can be quoted separately. You will be invoiced every 12 months for the hosting of your site. If you are not sure that WorldAncestors is the right way to go for your project, we are offering a 7 day free trial. You will be able to use all the features of the TNG software. Follow the link below and fill out the registration form. This offer is only available for a limited period and will end on 31 January 2016.